We are proud to announce the First Circuit Church is happening this Sunday. Circuit Church is both a learning exercise and a skills challenge. A night of quick turn electronics with a curated Bill of Materials (B.O.M.). Building hardware is hard, and like most hard things, only experience eases the pain. 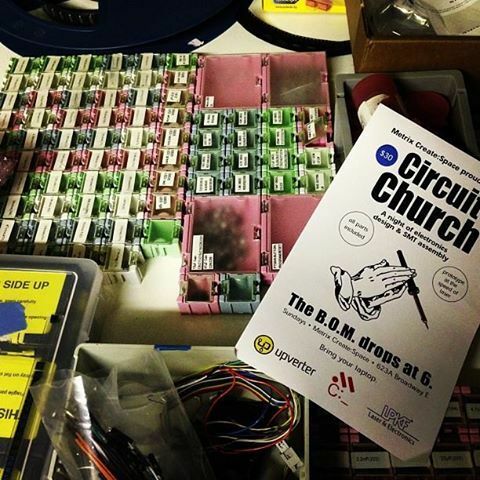 Circuit Church is designed to skill us all up on making electronics from scratch, fast. 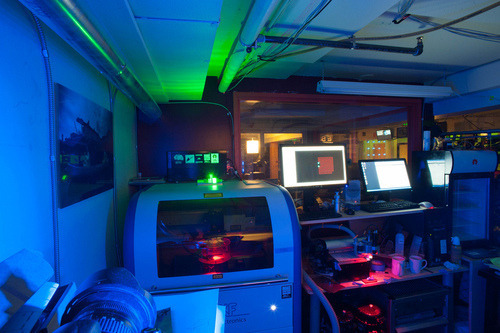 At the beginning of the summer, Metrix Create:Space added a LPKF Protolaser S to the robot roster and we built out our Advanced Circuit Lab as an adjunct to the Open Hardware Lab. For those of you that don’t know, this machine allows us to create circuit boards more accurately and on more materials than chemical processing with no hazardous materials impact. It’s more reliable than milling, and it is faster than anything else out there, including the fastest quick turn pcb houses. It allows us to go from design to physical board in minutes rather than hours, days, or weeks. Just like 3D Printing’s rapid results change the way we think about physical fabrication, this tool changes the way we think about electronics projects, the speed in which we implement, the materials we pick, and the chances we can take when we’re not waiting weeks for an iteration. We know that having a tool like this is a game changer. Additionally, we’ve been lucky enough to find Upverter, a cloud-based PCB design tool that gives us the ability to share designs quickly. It runs on limited resource computers, yet is powerful enough to do very complex boards and its free to use for Open Source / Open Hardware projects. We’ve found that its easy to learn even if you only have a basic knowledge of electronics, and we’ll be learning more and more about this tool as we go down our path. Circuit Church is a program that we believe will get us all up and running towards and making the future we want. Circuit Church is Sunday nights and costs $30. Space is limited, so call or come by to sign up. Designs get sent to CAM and are processed by 9pm. All participants will bring a computer for designing their board in upverter. All participants get a chance at each step. If you don’t finish a design, one will be provided for you for the assembly process. Help will be provided, but this is not a workshop environment with step by step instructions. This is an exercise to help you learn and advance your SMT skills in a fun and collaborative environment.